If it seems like Scott is everywhere lately, it might be because you've seen his smiling face on the cover of Ohio Sports & Fitness magazine this month. He was profiled about his extensive bicycle collection by our very own Kevin Madzia, whose writing talents have long been featured on this blog. You can read the profile below, or click here to read the complete April issue. 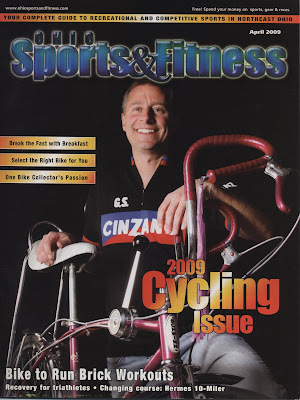 Many thanks to Stacy Rhea, editor of OS&F, for her interest in featuring Scott's passion for bicycles in the magazine's annual cycling issue. Thanks, too, to Ruggero Fatica (who took the cover photo of Scott) and to Century Cycles' own Doug Charnock and Mike Petcher, who photographed some of the bikes in the collection that were featured in the magazine -- some of which they couldn't include due to space constraints, but which I will post on the blog in the days to come for your viewing pleasure. If you wander around Scott Cowan’s house, his passion for bicycling is apparent on the walls and shelves of virtually every room, which are adorned with his extensive collection of more than 100 bicycles and countless components, books, signs and memorabilia. His passion extends to all parts of his life, including his work as the owner of three Century Cycles bicycle shops. Cowan discovered his passion for bicycling as a kid, and did not give it up once he got old enough to drive. His first bike was a copper-colored Schwinn Typhoon that he rode all over town. When he finally outgrew it, he bought a 10-speed, which he rode throughout high school and college. He wanted to buy himself a college graduation gift, but without an immediate job he could not afford a new car, so he bought a new bike instead. Cowan started collecting bikes in 1993 when he came across a J.C. Higgins balloon tire bike that he found at an antique store. A few years later, he was delighted to come across a copper-colored Schwinn Typhoon, just like the one he had as a kid. bikes have been purchased on eBay. One of his favorite bikes is an old tandem that is still ride-able. It has a mechanism that allows it to be steered from the rear seat. “It’s such a blast to ride, and it freaks people out when they see me on it,” he says. His oldest bike is a mid-1930s tricycle with wooden rims. The newest vintage bike is a blue Miyata racer. His newest modern bike is a track bike with an old-school design, the Giant Bowery ‘72. An important part of Cowan’s collection is a hard-cover notebook, which contains handwritten records of bike acquisitions. The location, price and other details of each transaction are described in detail. One entry reads, “A bottle of single-barrel Jack Daniels and $370 for an old Raleigh Chopper.” About another bike, Cowan wrote it took one week to finalize the deal. The collection is not limited to complete bikes. There are piles of old wheels, crank sets, shifters, brakes, handlebars, you name it, Cowan has it. Sitting next to a like-new Roadmaster cruiser is a 6-inch die-cast model of it, identical in detail down to the red and black paint job. Look closer and you notice a 3-inch Christmas tree ornament version of the same bike. A couple of small boxes sitting on a workbench contain several lifetimes’ supply of old 1-inch pitch chain links. “Someday, I will own them all, and then they will all have to come to me,” he says with a grin, while rubbing his hands together mock-villain style. In the basement, your eyes will catch other collections and odds and ends. A giant plastic bin of marbles. An antique rotary-style telephone. Bottles of wine. Cigar boxes. Neon signs. Model trains and airplanes. Several boxes of card files "for when card files come back in style," Cowan says. Cowan's pack-rat tendencies stem from his love and appreciation of the art in everything, especially in the design of practical things. He has always been a fan of Viktor Schreckengost, an industrial designer and sculptor from Cleveland how lived to the ripe age of 102. Cowan says Schreckengost was "very creative, forward-thinking and ahead of his time." Schreckengost designed pottery, dinnerware, engines and of course, bicycles. In Schreckengost, Cowan sees the embodiment of his philosophy of life, a philosophy that he also recently found expressed in a quote by Howard Thurman, a noted philosopher and civil rights leader. "Don't ask yourself what the world needs; ask yourself what makes you come alive. And then go do that. Because what the world needs is people who come alive." And it's bicycles of all shapes, sizes and eras that make Cowan come alive. Kevin Madzia has a passion for cycling himself, with several long bike trips under his belt, including one from Seattle to Boston, and another from Cleveland to Guatemala. He is the Web master for Century Cycles and the editor of the bike commuter blog carlessohio.org. Very nicely written, Kevin!! You seem to have a natural writing ability. And kudos to Scott for making the cover of Ohio Sports and Fitness! Yay! !